The Champions’ Circle members understand their high-level financial commitment will assist Voices in building a sustainable foundation for our policy work and help us plan for the future. Your financial leadership provides us with the stability and flexibility to respond to the emerging needs of the commonwealth’s children, particularly the most vulnerable. It also ensures that Voices remains the leading independent, nonpartisan advocate for children at the state Capitol. Because we do not receive any public funds, we are able to put the interests of Virginia’s children first. Members of our Champions’ Circle receive a sneak-peek video that is emailed from our Executive Director, Margaret Nimmo Holland. In these short videos, she highlights what’s happening in the world of child advocacy and keeps our “Champions” up to date. Make your financial contribution today and be a part of Voices’ Champions’ Circle so you can also receive the inside scoop! 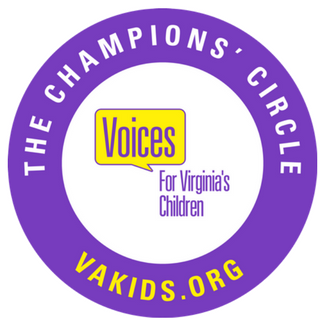 Learn more about The Champions’ Circle in our brochure or by contacting Katie Ferguson at katie_at_vakids_dot_org or (804) 649-0184, ext. 108.